Coconut milk, sticky rice and fresh mangos–what could be better? How about it’s also super simple to make! It’s one my go-to desserts when I need to whip up a dessert fast and the dish I bring frequently to pot-lucks and get-togethers. If mangoes aren’t in season or difficult to find where you live, use papaya, strawberries or any seasonal fruit. It all works well. Once again, this recipe uses my beloved rice cooker to make cooking quick and easy. Don’t forget to serve this amazing dessert with the delicious Coconut Sauce. Enjoy! Wash the sticky rice several times until the water runs clear. Soak the rice for 1 hour. Rinse the rice one more time and drain well. Add rice to the rice cooker along with the coconut milk, water, sugar and salt. Stir together combining all ingredients well. Set rice cooker to ‘Cook’. Allow to cook until the button switches over to ‘Keep Warm’. Stir the rice. Cover and allow to cook for another 10 minutes. Peel mangoes and cut into thin slices or cubes. 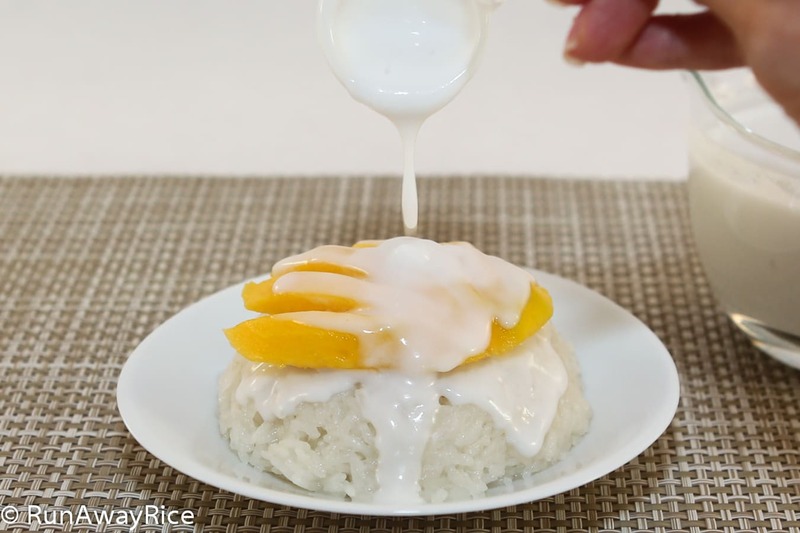 Spoon sticky rice into dessert bowls and add fresh mangoes on top. Serve with the Coconut Sauce. So good! I had this for the first time at a restaurant recently and decided to try it myself at home. This recipe made it very, very easy. I have not made the sauce but did serve the rice with mango, and it was delicious. Thank you for this very easy method. We will be having this regularly now, I’m sure.